Hailing from South Dakota, classically trained singer, pianist, violinist and violist, Rachel Ries astonishes with her brand of music. And although this album is a couple of years old, it’s still worth listening to. 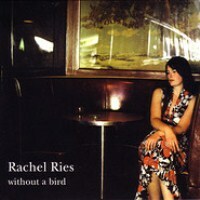 Without a Bird, Rachel’s second album, is composed of a folk jazzy sound with beautiful lyrics. It first came out back in 2007 under Rachel’s own So Dak Records. Her first album, For You Only, was initially released back in 2005 and was completely recorded in a vintage analog system. This second album was also done in analog, thus exuding a beautiful vintage feel. It’s the type of songs you’ll want to play at home on a laid back evening, relaxing and just taking in the moment. If you love your vintage 30s and 40s jazz pop, then it takes just one listen to fall in love with Rachel Ries. Her capacity to add a modern touch to these vintage style songs is amazing and that’s not even counting her gorgeous vocals. Mixing her beautiful piano sounds, jazz/blues style vocals, eloquent lyrics and lovely melodies; the album is a delight to listen to. Some of my favorite tracks include Chicago with its Regina Spektor-vibe; Learning Too Slow and its mid-tempo, slightly country sound; as well as When Will You Be Mine which is one of the best tracks reminiscent of 40s and 50s sultry singing sirens. Overall, this album is definitely a great find. One of the best records I’ve listened to in quite a while. Currently, Rachel is slowly but surely compiling and preparing songs for a possible album. It’s certainly one to watch out for. In the meantime, grab this release. It’s available as a free download under Rockproper.com.